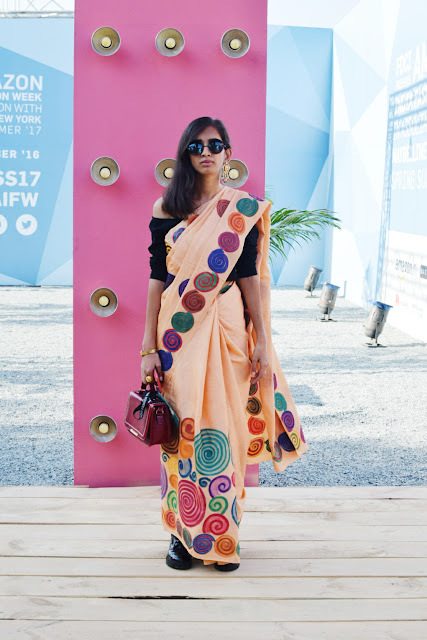 For the day two, I decided to follow the concept of Indian Handloom Textile with an amalgamation of #IndiaModernFestive theme and wore a quirky handpainted Silk saree, paired up with a classic off shoulder top. Ethnic fusion be my love, remember? To balance with the vivid pattern on the saree I decided to add oxblood accents in form of a clutch & a pair bluchers. 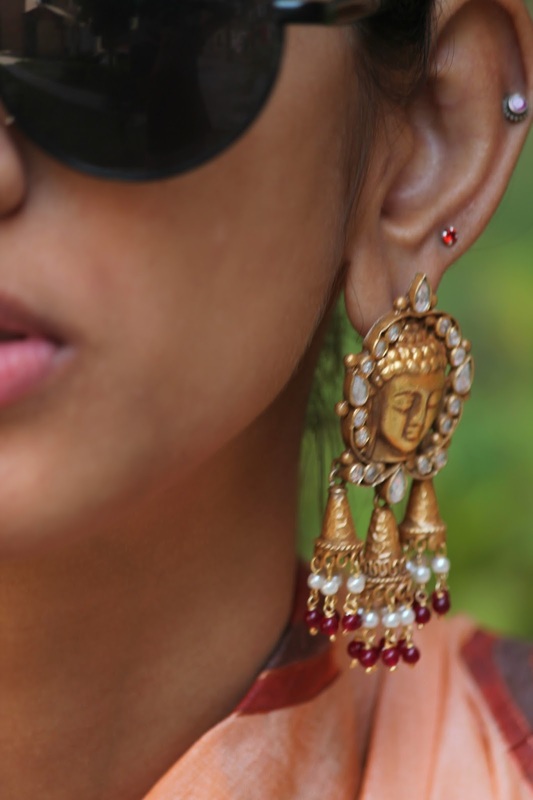 One thing that I planned to keep consistent for all five days was to sport beautiful statement jewelry. While on day one it was an oxidised silver necklace, here I wore exquisitely crafted Buddha earrings & a cobweb ring. Finally asymmetrical hairdo & eccentric sunglasses & I was good to go! 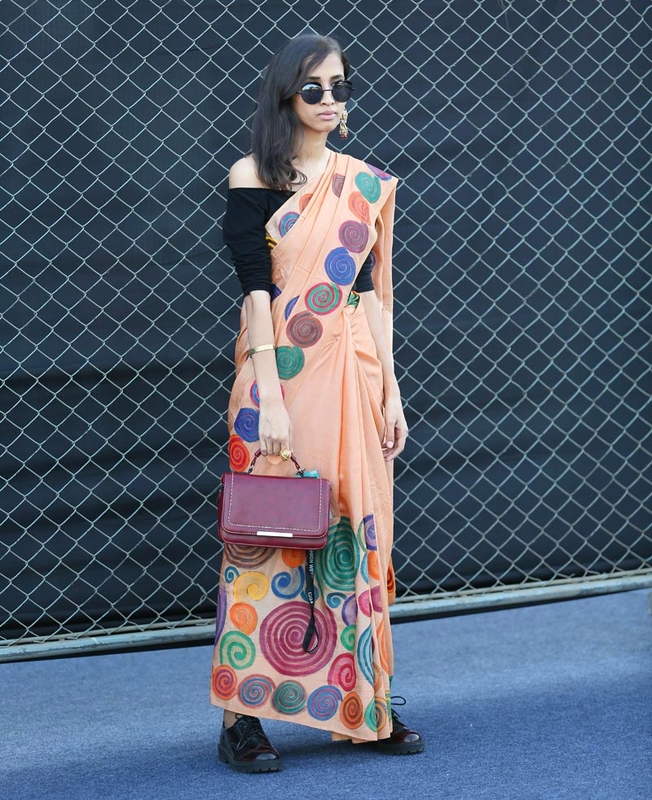 Day two began with Virtues by Viral, Ashish & Vikrant, who presented Mrs. Nair's High Tea with layered, flared and pleated dresses created using the traditional handlooms and weaves from Odisha. This was followed by Pinnacle by Shruti Sancheti's SS17 collection whose floral dresses, jackets and more created a perfect summery ambiance. Prama by Pratima Pandey promised to encourage craftsmanship & sustainability by laying emphasis on natural fabrics & indigenous embroidery techniques. Beautiful sheer dresses and kurtas paired up with crushed midi skirts, in light color palette was a delight to the eyes! Urvashi Kaur's collection 'Kul' designed using pastel hues was an ode to totality and oneness in terms of social cross pollination. My personal favorites were the brick red Maxi & the printed pantsuit. Akaaro by Gaurav Jai Gupta was all about metallics made up of handwoven fabrics in blends of silk, cotton, zari and stainless steel. Splendid to say the least! And finally it was time for Anavila's showcase of comfy jumpsuits, chic jackets and the highlight of the show being pocketed saris, presented on a neutral color palette. Payal Pratap's SS17 collection was all about effortlessly stylish silhouettes weaved in silk chanderi, cotton & khadi. Crochet patterns & embroideries ruled the showcase. 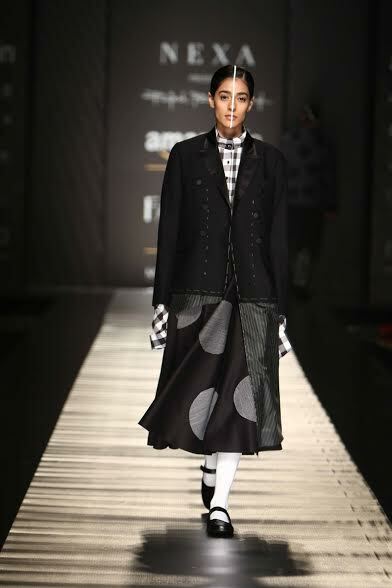 Abraham & Thakore explored khadi and presented a beautiful synthesis of traditional & modern aesthetics. Quintessential prints on gold & silver tones were the major elements of the collection. The day came to an end with a monochromatic enchantment of power dressing for both men and women, by Ashish N Soni & Rajesh Pratap Singh. 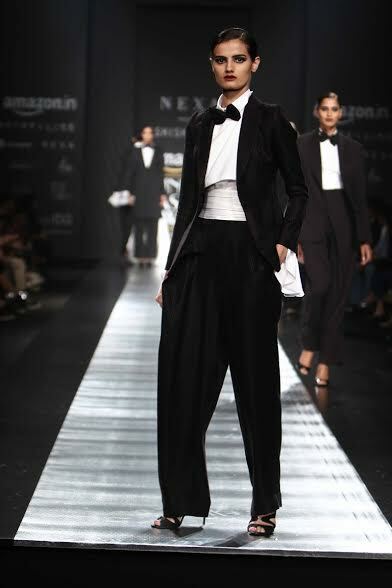 While tuxedos for women & glittering blazers for men ruled Ashish's collection; Pantsuits in polkas, tartans & plaids upped the androgynous game in Singh's showcase.